Welcome to a new year, which means that a new cycling season is just around the corner. 2013 is, of course, the year of the 100th Tour de France, but there is a whole lot more to grab our attention over the coming ten months. As ever, January is more of a limbering-up than a full-blooded racing month, but there’s still plenty of action to look forward to around the world, both on the road and here on VeloVoices. Here’s a summary of what to expect this month. The 2013 UCI WorldTour kicks off, as has become customary, with this congenial, sprinter-friendly leg-stretcher of a race. It provides the peloton with the chance to shake off the ring-rust in the temperate climate of an Adelaide summer. We’re unlikely to see any of the serious Grand Tour contenders here – and certainly not in anywhere near hors catégorie shape – but we can expect to see a combination of sprinters and Aussie riders looking to claim early season glory. Last year Lotto-Belisol’s Andre Greipel (the overall winner in 2008 and 2011) won three stages but it was Simon Gerrans who claimed overall victory for GreenEDGE on their WorldTour debut to make it three ‘home’ winners in five years. This year’s parcours again features a penultimate day summit finish on Old Willunga Hill which will almost certainly decide the overall, but in among the obvious sprint stages there are lumpy finishes on stages two and three which could promote a successful breakaway or a Classics-style selection to weed out those sprinters who resolutely prefer it flat. As ever, we’ll have a comprehensive preview closer to the race, but if you can’t wait you can find out more on the official website here. Tour de San Luis (21st-27th, Argentina): A week-long race taking in some spectacular scenery across central Argentina. Last year’s race was dominated by Omega Pharma-Quick Step, with Francesco Chicchi (two) and Tom Boonen winning three of the four flat stages and Levi Leipheimer winning the individual time trial to lay the foundations for overall victory, despite a certain Alberto Contador triumphing on the two summit finishes. GP Cycliste La Marseillaise (27th, France): A relatively short (around 150km) one-day race finishing in Marseille. Cofidis’ Samuel Dumoulin (now with AG2R) won last year’s race, emerging triumphant from a small group sprint. Etoile de Bessèges (30th-3rd February, France): Typically a mix of sprint, climbing and time-trialling, this five-day stage race is the first real European test for riders with ambitions in the major one and three-week races to come. Saur-Sojasun’s Jerome Coppel claimed overall victory last year by virtue of dominating the concluding individual time trial. 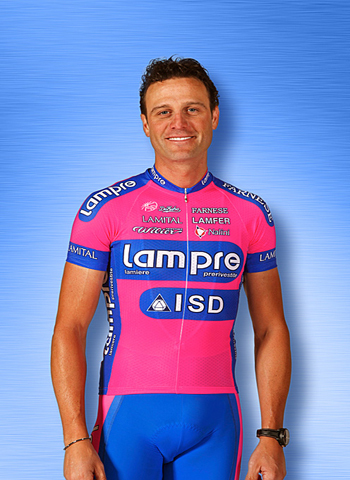 3rd: Alessandro Petacchi, Lampre-ISD (39 years old). The veteran sprinter is very much in the twilight of his career now, with just four victories – three at Bayern Rundfahrt and none in WorldTour events – to his name in 2012. During his long career he has won 48 Grand Tour sprint stages and also the points classification at all three Grand Tours. 7th: John Degenkolb, Argos-Shimano (24). A double-stage winner at the 2011 Critérium du Dauphiné, 2012 was a breakthrough season for the young German sprinter, culminating with five stage wins at the Vuelta and fourth in the World Championships road race. He also had a good spring Classics season, finishing fourth at Paris-Tours, fifth at Milan-San Remo and sixth at E3 Harelbeke, and overall victory at the Tour de Picardie helped propel him to become the top rider in the UCI Europe Tour standings. 11th: Cameron Meyer, Orica-GreenEDGE (25). The 2011 Tour Down Under winner added his sixth senior gold at the World Track Championships in the points race in 2012, as well as finishing tenth overall at Tirreno-Adriatico and 11th at the Tour of California. 12th: David Zabriskie, Garmin-Sharp (34). The time trial specialist has had many of his best results stripped away as a result of his role in the US Postal doping programme, for which he is also suspended until 1st March. 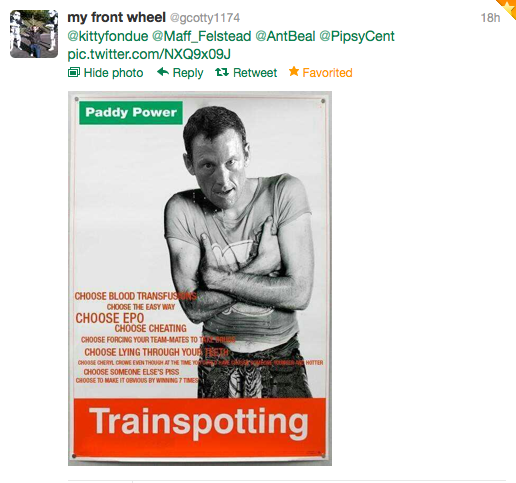 He had previously ‘won’ six Grand Tour stages and held the yellow jersey at the 2005 Tour for three days. In 2012 he won individual time trials at the Tour de Langkawi and the Tour of California, finishing second overall at the latter. 18th: Thor Hushovd, BMC (35). A winner of 14 individual Grand Tour stages and the 2010 World Champion in the road race, Hushovd endured an injury-shortened 2012 season in which he was winless for the first time in his career and achieved just one top-five finish. He will be hoping to bounce back in 2013, although his opportunities to compete for wins alongside reigning world champion Philippe Gilbert at BMC may be limited. 26th: Peter Sagan, Cannondale (23). 2011 was a stellar year for the ‘Fast-vak’ – most notably three stages at the Vuelta, two stages and the overall at the Tour of Poland, two stages and the points classification at the Tour de Suisse and the overall at the Giro di Sardegna – but 2012 was even more spectacular. Three stages and the green jersey at the Tour were probably the highlight, but he also won five stages at the Tour of California, four at the Tour de Suisse and managed a second (Gent-Wevelgem), third (Amstel Gold), fourth (Milan-San Remo) and fifth (Tour of Flanders) during the spring Classics season. A Classics victory will be a key objective this year – he has already said he is targeting Milan-San Remo – and autumn might just see him in rainbow colours too on a course in Florence which looks likely to suit him. 30th: Richie Porte, Sky (28). The Tasmanian thrived in the first half of the 2012 season, winning the overall at the Volta ao Algarve and finishing fourth and ninth respectively at the Tour de Romandie and the Critérium du Dauphiné before being a key lieutenant in the mountains as Bradley Wiggins rode into yellow at the Tour. He is still probably best known, however, for the three days he spent in the maglia rosa as overall leader of the 2012 Giro, where he won the young rider classification. We’ll be kicking the blog back into high gear ready for the start of the season, which means reader favourite Tweets of the Week will be back in its usual slot every Tuesday. Our weekly Friday Feature will also return to bring you interviews, photo features and expert analysis. 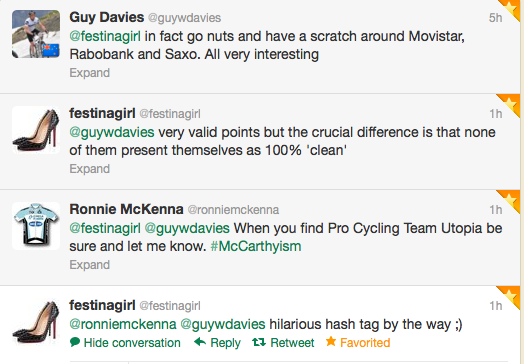 Each member of the VeloVoices staff is selecting three riders and one team to profile and follow throughout the year. Keep an eye open for our selections and initial overviews towards the middle of the month. Finally, look out for our start-of-season round-table, where we will look forward to what we can expect from our favourite riders, teams and races in 2013. Plus much, much more on both our Facebook page and Twitter. 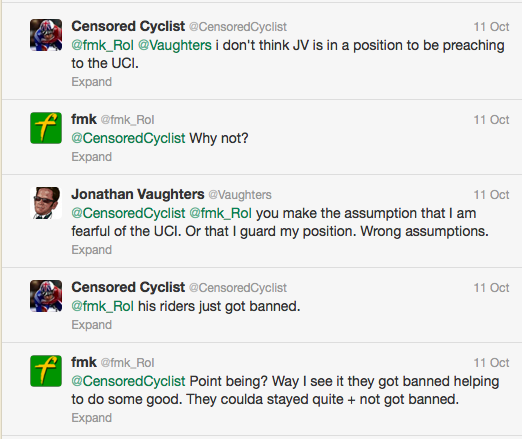 Whether serious or light-hearted, VeloVoices is the place to come for all the latest cycling news and views! 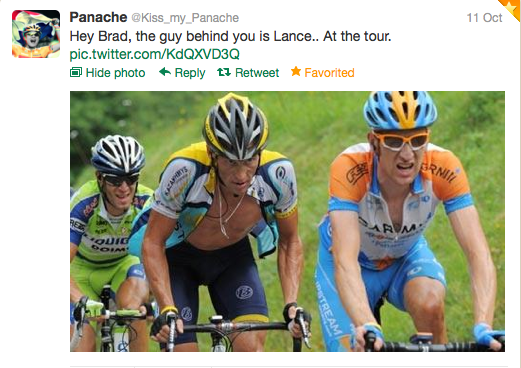 Pro cycling for fans, by fans. Earlier this week, the USADA report was released to the public. It was more damning (and detailed) than most of us ever anticipated. As usual with these types of Tweets Specials, this is by no means a comprehensive reading of what is being said on Twitter – I have tried to pull out some of the big issues over the past few days and give as many sides of the argument as I can. Released on October 10th, the summary of the USADA report ran to 200 pages, while the report itself was a thumping 1,000 pages. The official USADA link to the report is here, and Outside’s cliff notes are here. The fact that the report is so long and comprehensive means that this will be picked over for weeks/months to come and it will almost certainly reach into every aspect of cycling, bringing down more than a few people who are still active in the sport. 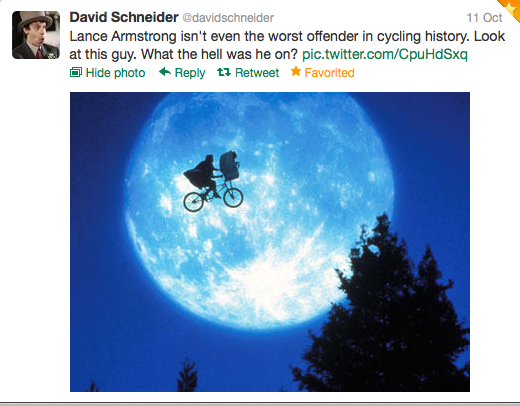 There were 11 former teammates of Lance Armstrong‘s who testified to the USADA: Frankie Andreu, Michael Barry, Tom Danielson, Tyler Hamilton, George Hincapie, Floyd Landis, Levi Leipheimer, Stephen Swart, Christian Vande Velde, Jonathan Vaughters and David Zabriskie. 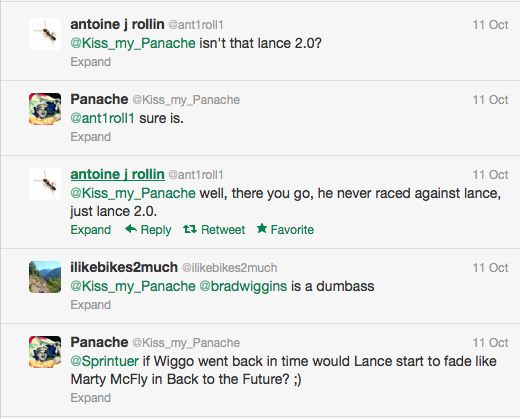 Some of these riders posted something on their Twitter page, some didn’t. 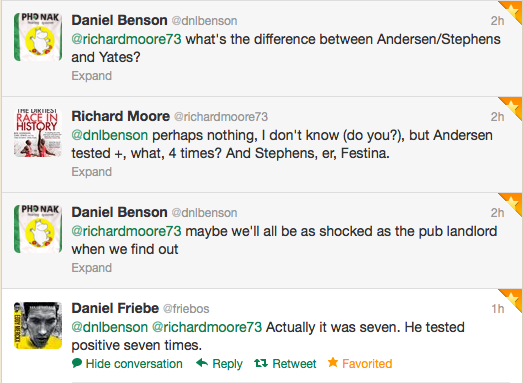 Here I’ve sorted out some reactions to the testimony. The link for Christian’s statement is here. The link for George’s statement is here. 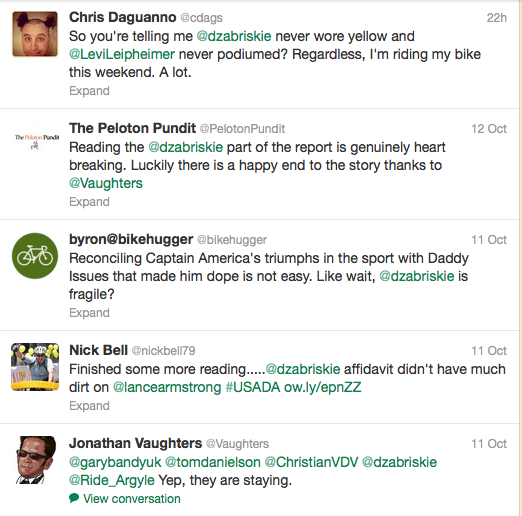 The article about Zabriskie’s background is here. It seems almost every hour there’s another name, another line of questioning, another statement of innocence or guilt. It really is almost impossible to keep up with. I’ve selected a few of the higher profile scalps that have gone due to the USADA report – and those that almost certainly will have to. 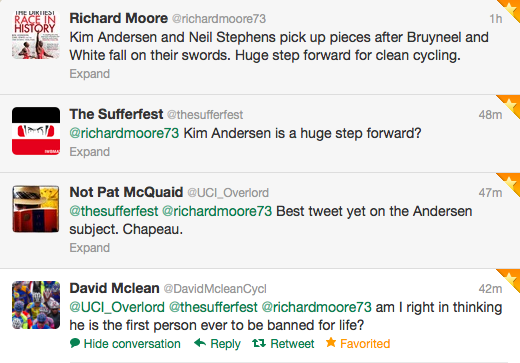 We have to start with one of the biggest scalps of all and that is, of course, Johan Bruyneel. His statement is here. He says he left of his own accord; other reports say he was fired. Matt White, who was key to putting together the Orica-GreenEDGE team, stepped down from his management role with the team and as a selector for the Australian national road team after he was linked to doping through Floyd Landis’ testimony to the USADA. His statement is here. 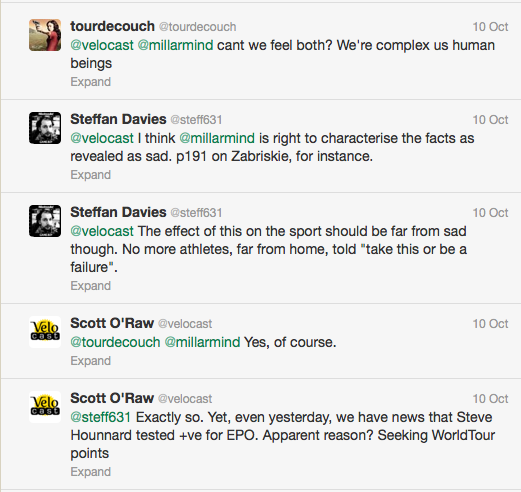 One of the biggest losers in this week’s PR battle was Team Sky and their interpretation of ‘due diligence’. They have fallen foul of their own much-publicised stance of ‘no one involved in doping at any point will be tolerated on the team’. 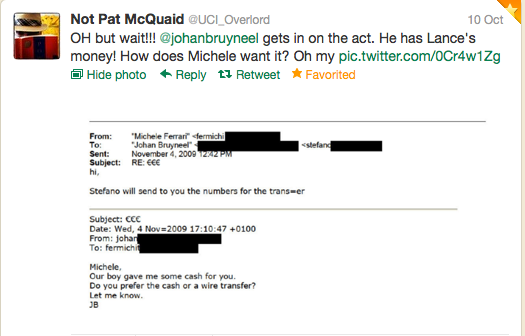 Not only did Michael Barry give evidence as one of the 11 riders (gracefully retiring from Sky before the testimony became public), but questions were also being asked about Michael Rogers, as he was named in the USADA report concerning his links with Michele Ferrari. Background article on this is here. 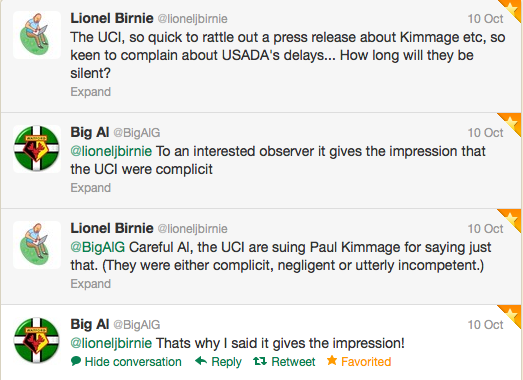 Considering Sky’s stance on riders or personnel who have the shadow of doping over them, it will be interesting to see how this plays out. 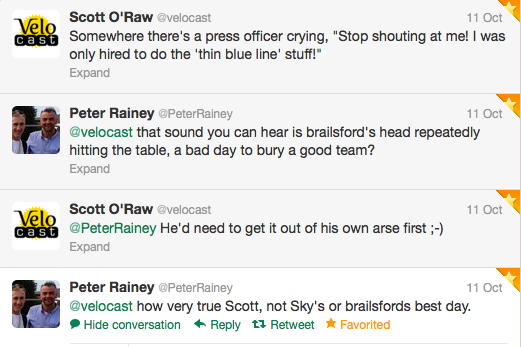 Especially as Brailsford also has to deal with the Sean Yates question – although his past was hardly unknown when the team started (check Wikipedia). 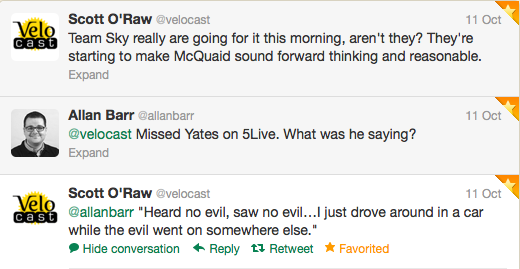 Yates did a radio interview and, basically, made a hash of it. The audio link is here. And this is what his statement reminded a few people of. 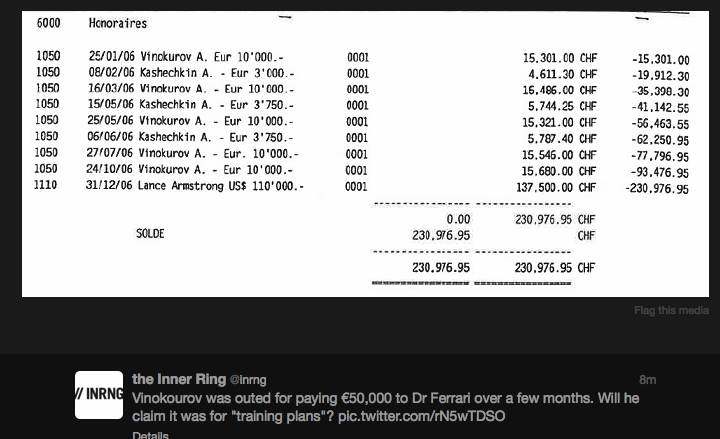 The Telegraph article that has been referenced in the above tweets is here. And we also have Alexandre Vinokourov and Viatcheslav Ekimov moving into management positions with Astana and Katusha respectively. 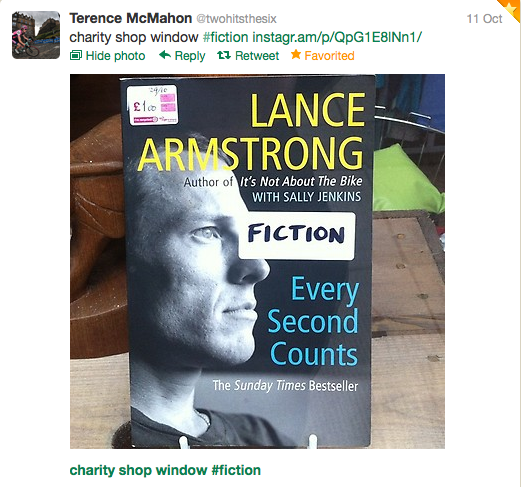 Of course, we also have Bjarne Riis, who has been implicated in Tyler Hamilton’s book, as well as in David Zabriskie’s admission of his doping while at CSC. As someone said to me the other week, the rabbit holes go very deep. 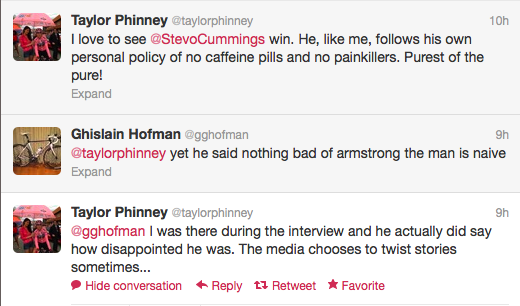 There was much consternation in the Twittersphere about the lack of current riders rising up to condemn Armstrong and out other riders they know to be doping. While not being an apologist for those who keep the omerta, not being a part of that world, how can we possibly know what goes through a cyclist’s mind when confronted with this? 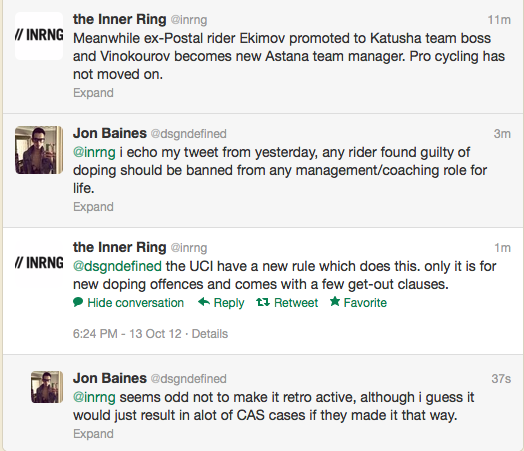 The USADA report clearly details riders losing their jobs, being shunned and bullied, for speaking up. 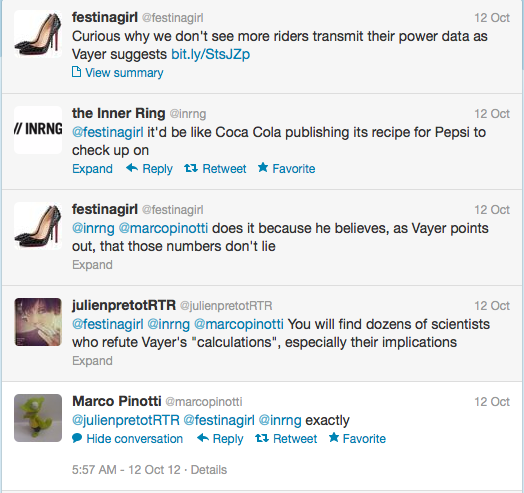 Hopefully there’s power in numbers now and more riders will speak up but, until then, let’s cut them a little slack. 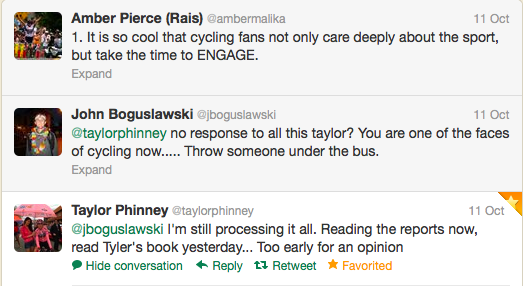 That said, there were some riders who did make statements and engage with fans, both young bucks and old hands. 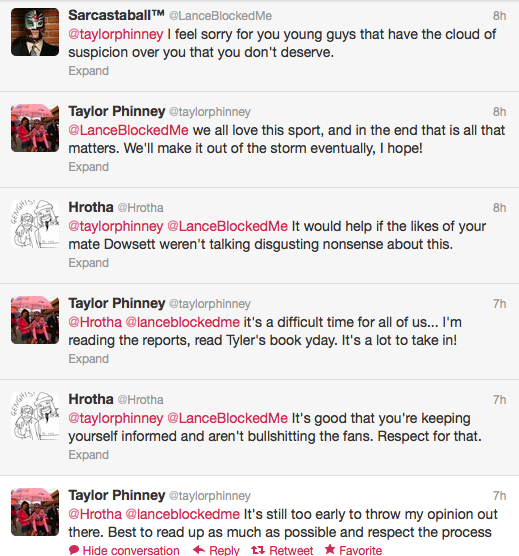 Let’s start with Taylor Phinney. Marco Pinotti has always been outspoken when it comes to the subject of doping and has always worked to ensure transparency around his training and his performances, and this is perhaps one of the best examples of how the doping culture helped rob him of results. A man of quiet integrity. 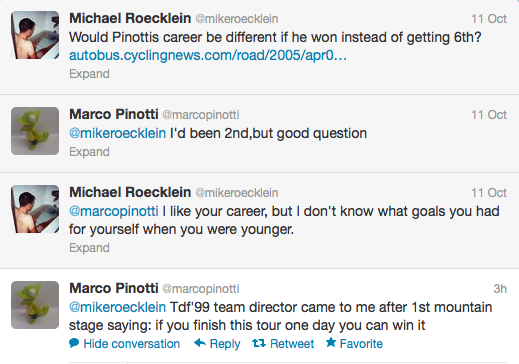 Marcel Kittel said it very succinctly. 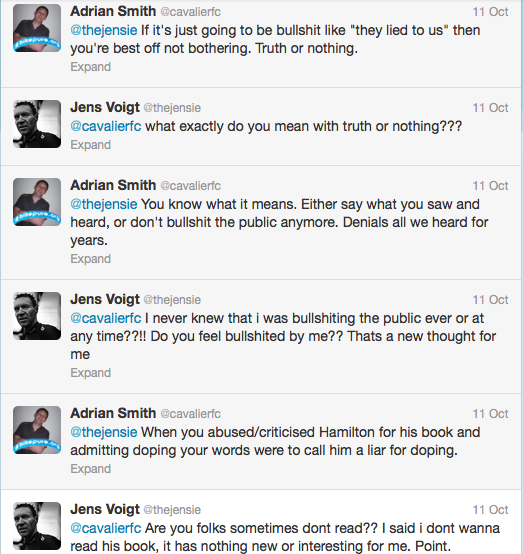 Jens Voigt also had a few things to say. 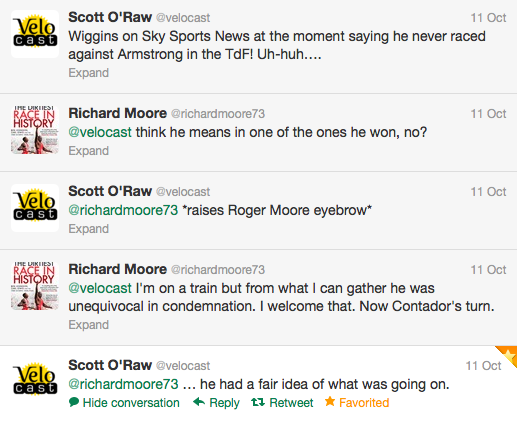 Bradley Wiggins did an interview and put his thoughts forward – and it was quickly noted that he had a selective memory. 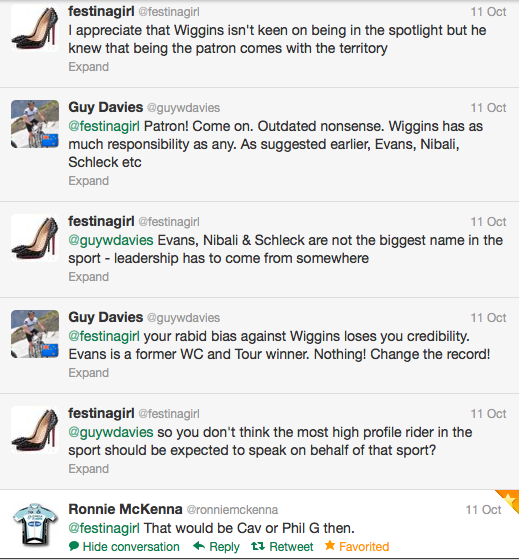 The Sky Sports interview is here and here are more comments. 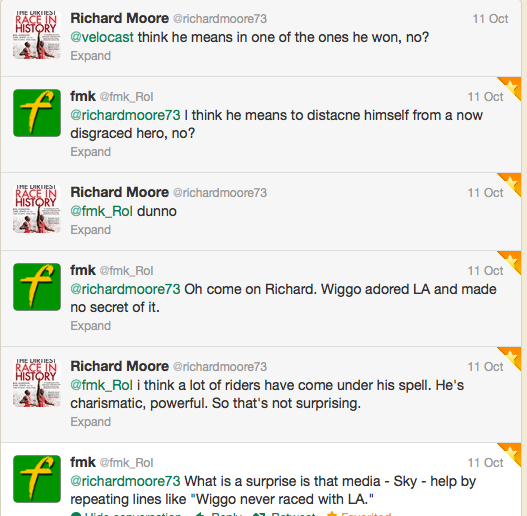 No doubt there will be more Tweets of the Week specials as more revelations see the light of day. But in the meantime, I’ll leave it to @TourDeJose and @DeeDee315 to say what I certainly feel – and I hope you all do too.